ISLAMABAD: Name of new chief of Pakistan Army will soon come to the fore as outgoing Chief of Army Staff General Raheel Sharif has already started farewell visits. 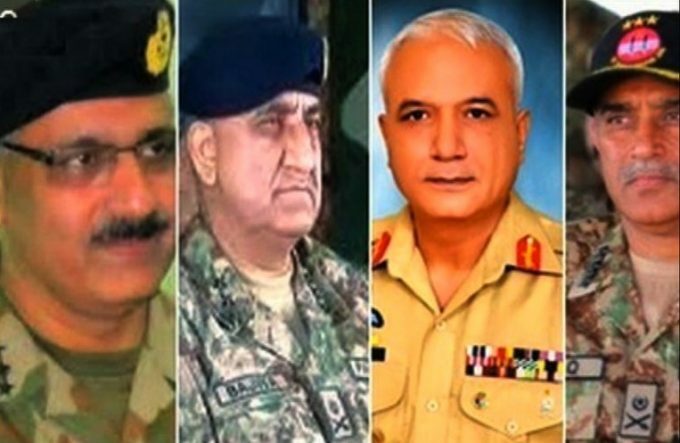 According to sources, there are four lieutenant generals in the seniority list with Chief of General Staff Lt. General Zubair Hayat in the lead. Corps Commander Multan, Lt. General Ishfaq Nadeem is second in this list, followed by Corps Commander Bahawalpur Javed Iqbal Ramday and Inspector General Training and Evaluation Lt. General Qamar Bajwa in third and fourth positions respectively. Prime Minister Nawaz Sharif is entitled to promote any three-star general to the level of four-star general. Lt. Gen. Zubair Mehmood Hayat is currently working as Chief of General Staff. He functioned on vital positions including Corps Commander Bahawalpur and Director General Strategic Plans Division before assuming his present office. He was also Principal Staff Officer with former Army Chief Gen. Ashfaq Parvez Kayani as a Brigadier. His retirement is due in January 2017. Lt. Gen. Ishfaq Nadeem is Multan Corps Commander. He had been Chief of General Staff and Director General Military Operations. His retirement is due in August 2017. Belonging to 62nd Long Course, Lt. Gen. Javed Iqbal is presently commanding Bahawalpur Corps. He previously functioned as president of National Defence University. His retirement is due in August 2017.